The ability to recognize foreign double-stranded (ds)DNA of pathogenic origin in the intracellular environment is an essential defense mechanism of the human innate immune system. However, the molecular mechanisms underlying distinction between foreign DNA and host genomic material inside the nucleus are not understood. By combining biochemical assays and single-molecule techniques, we show that the nuclear innate immune sensor IFI16 one-dimensionally tracks long stretches of exposed foreign dsDNA to assemble into supramolecular signaling platforms. We also demonstrate that nucleosomes represent barriers that prevent IFI16 from targeting host DNA by directly interfering with these one-dimensional movements. This unique scanning-assisted assembly mechanism allows IFI16 to distinguish friend from foe and assemble into oligomers efficiently and selectively on foreign DNA. The immune system defends us from attacks by viruses, bacteria and other microbes. One way that the immune system can identify these invaders is by detecting genetic material from the microbes. Like us, many of these microbes have genetic material made of a two-stranded molecule called DNA. A protein called IFI16 is an important sensor in immune cells that can bind to foreign DNA, but not to the DNA of the host. If the ability to discriminate between host and foreign DNA is lost, then immune cells start to attack the body’s own tissues, which can lead to severe “autoimmune” diseases. However, it is not clear how IFI16 and other sensor proteins are able to tell foreign and host DNA apart. DNA in host cells is packaged in particular proteins to form structures called nucleosomes that can make it difficult for other proteins to bind to the DNA. When foreign DNA enters the cell, IFI16 promotes the formation of nucleosomes on these molecules, but the nucleosomes are further apart than those in host DNA, which leaves longer stretches of “exposed” DNA between the nucleosomes. In 2014, a group of researchers reported that multiple molecules of IFI16 associate with each other and form clusters on exposed foreign DNA. Here, Stratmann, Morrone et al. – including some of the researchers from the earlier work – investigated how IFI16 selectively binds to foreign DNA using a combination of biochemical and single-molecule techniques. The experiments show that to start with, a few molecules of IFI16 bind to stretches of exposed foreign DNA and then move along the DNA strands. As more molecules of IFI16 bind to this DNA, they bump into each other and start to form clusters that eventually become immobile. Further experiments show that the more tightly packed nucleosomes in host DNA molecules act as a barrier to IFI16 cluster formation because they interfere with the ability of the protein to move along the DNA. Stratmann, Morrone et al.’s findings show that IFI16 can only trigger immune responses when it binds to stretches of exposed DNA that are long enough to allow the assembly of IFI16 clusters. The next challenge will be to see whether other DNA sensors employ similar strategies to detect foreign DNA. The host innate immune system detects infection by directly recognizing molecular signatures associated with pathogens (Janeway and Medzhitov, 2002; Medzhitov and Janeway, 2000). Remarkably, such signatures include universal building blocks of all life, such as DNA and RNA (Janeway and Medzhitov, 2002; Orzalli and Knipe, 2014; Paludan and Bowie, 2013). In the cytoplasm, the immune system relies on the absence of endogenous DNA, and thus marks all detected DNA as 'foreign' (nonself) (Orzalli and Knipe, 2014; Paludan and Bowie, 2013). However, DNA viruses often evade the cytosolic detection machineries, as their genomes are not exposed until reaching the nucleus (Orzalli and Knipe, 2014; Paludan and Bowie, 2013). The host counters this infection strategy in the nucleus by directly assembling supramolecular signaling platforms that trigger inflammatory responses on invading foreign DNA, but not on its own genomic material (Johnson et al., 2013; Li et al., 2012; Kerur et al., 2011). Although key players that target foreign dsDNA in the host nucleus have been identified (Orzalli and Knipe, 2014; Paludan and Bowie, 2013), the molecular mechanisms by which these sensors distinguish self from nonself dsDNA remain unknown. The interferon-inducible protein 16 (IFI16) is a key innate immune sensor that detects foreign dsDNA and uses it as a scaffold to assemble supramolecular signaling platforms in both the host nucleus and cytoplasm (Unterholzner et al., 2010; Johnson et al., 2013; Li et al., 2012; Kerur et al., 2011; Orzalli et al., 2012) (Figure 1A). IFI16 plays a central role in defense against a number of pathogens (e.g herpes simplex virus-1) (Unterholzner et al., 2010; Johnson et al., 2013; Li et al., 2012; Kerur et al., 2011; Orzalli et al., 2012). On the other hand, persistent IFI16 signaling is associated with autoimmunity (e.g. Sjögren’s syndrome) (Mondini et al., 2007; Choubey et al., 2010; Mondini et al., 2010; Gugliesi et al., 2013; Smith and Jefferies, 2014). The molecular mechanisms by which IFI16 selectively targets foreign dsDNA remain unknown. To establish a functional signaling platform, IFI16 must overcome two challenges. First, individual IFI16 molecules must be able to locate one another on large pathogen genomes with sizes ranging from 105 to 106 base pairs (bps). Second and more importantly, this assembly mechanism can only take place on foreign dsDNA and must be inhibited on host dsDNA (Figure 1A). Here, we report the observation of a unifying molecular mechanism that explains how IFI16 resolves these central issues in initiating its foreign-dsDNA sensing pathways. IFI16 assembles faster on longer dsDNA. (A) Top: IFI16 is composed of three functional domains flanked by unstructured linkers, namely one pyrin domain (PYD) and two dsDNA-binding Hin domains (HinA and HinB; Hin: hematopoietic interferon-inducible nuclear antigen). Bottom: IFI16 detects foreign dsDNA from invading pathogens in both the host nucleus and cytoplasm. (B) Top: a cartoon scheme for FRET experiments. The two differentially colored ovals represent fluorescently (Dylight-550 and Dylight-650) labeled IFI16. Bottom: The time-dependent changes in the emission ratio between FRET donor and acceptor labeled IFI16 (50 nM) were monitored at 33 µg/ml of each dsDNA (e.g. sixfold higher than the dissociation constant for 39-bp dsDNA [Morrone et al., 2014]). Lines are fits to a first-order exponential equation (see Figure 1—figure supplement 1 for 25 nM protein). All shown representative experiments were performed at least three times. (C) A plot of observed assembly rates (kassms) vs. dsDNA-sizes (see also Figure 1—figure supplement 1). (D) 1D-diffusion assisted assembly mechanism can explain the observed assembly profile of IFI16. 1. At the same mass-concentrations, the number of individual dsDNA fragments present in each assay is inversely proportional to the length of dsDNA. 2. Individual IFI16 molecules initially bind dsDNA at random positions and diffuse one-dimensionally while searching for other respective protomers; the number of IFI16 residing on the same dsDNA fragment should be proportional to the length of dsDNA (e.g. there are four times more individual 150-bp fragments than 600-bp fragments) 3. IFI16 fails to assemble into an oligomer on dsDNA shorter than 60 bp (indicated by a red arrow pointing left). The saturating rates can be explained if the final FRET signals arise from formation of distinct optimal oligomers. Single Cy5-labeled IFI16 protein (1 nM) moving on double-biotinylated dsλ-DNA at 300 mM KCl (without flow). The movie is played at 5x acceleration. This video is related to Figure 2. To identify the mechanisms underlying assembly of IFI16 signaling platforms on DNA, we monitored the oligomerization kinetics of FRET donor and acceptor labeled IFI16 on naked dsDNA (FRET: fluorescence resonance energy transfer; Figure 1B and Figure 1—figure supplement 1). Previous work demonstrated the existence of such oligomers and reported on their equilibrium binding properties but did not provide insights into the assembly mechanisms (Morrone et al., 2014). Using various dsDNA fragment sizes present in excess, we observe that the assembly rate increased non-linearly and by 50-fold from 60 to 200 bps dsDNA, above which it stayed constant (up to 600 bps; Figure 1B,C). With a dsDNA-binding footprint of ~15 bp for one IFI16 (Morrone et al., 2014), our results indicate that about 4 copies are required to initiate assembly, and about 10 IFI16 molecules are required for optimal oligomeric assembly (Figure 1C). Further, the assembly rate constants scaled linearly with the IFI16 concentration for all measured DNA lengths (Figure 1—figure supplement 1 and Supplementary file 1A), indicating that a purely cooperative assembly mechanism is unlikely. In line with this observation, previous work reported relatively small contributions of cooperativity in oligomerization with Hill constants near 2 for DNA substrates up to 2000 bp (Morrone et al., 2014). Our ensemble-averaged, solution-phase observations of the faster assembly on longer dsDNA suggest a model in which IFI16 scans along dsDNA to increase the probability of encountering other IFI16 molecules (Figure 1D). To directly test such a mechanism, we used single-molecule fluorescence imaging to track the movements of individual Cy5-labeled IFI16 molecules on stretched, double-sided attached λ-phage dsDNA (λdsDNA; 48.5 kbps) (Figure 2A and Video 1). Figure 2B shows that individual IFI16 molecules one-dimensionally (1D) diffuse on λdsDNA while bound for several seconds. The diffusion coefficient of IFI16 increased with ionic strength, indicating that IFI16 does not maintain a continuous electrostatic interaction with the dsDNA backbone, but instead moves along the λdsDNA scaffold by executing microscopically small steps (Blainey et al., 2006) (Figure 2B and Figure 2—figure supplement 1). An IFI16 construct lacking the oligomerizing pyrin domain (PYD) (IFI16HinAB; see also Figure 1A) showed similar diffusional properties, suggesting that the dsDNA-binding HIN200 domains are responsible for 1D diffusion. 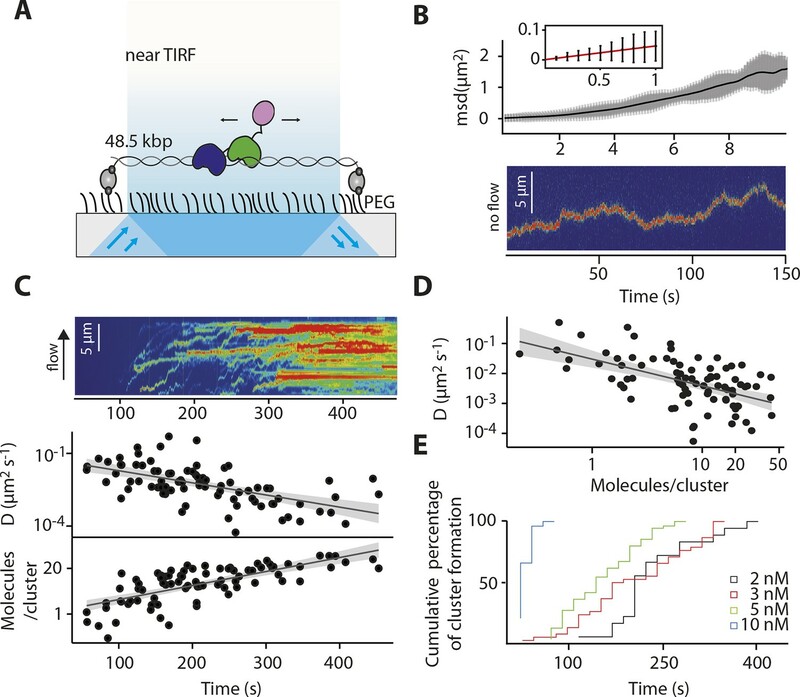 Upon applying higher concentrations of IFI16 with a constant supply of proteins into our flow cell, we observed a gradual formation of distinct, immobile clusters along λdsDNA (Figure 2C, Figure 2—figure supplement 2, and Video 2). Over time, we also observed an increase in the number of molecules per cluster and a concomitant decrease in the diffusion coefficient (Figures 2C,D). We analyzed the impact of flow on the diffusion coefficient and diffusion bias and found it to be not significant for cluster formation (Figure 2—figure supplement 4). Single-molecule intensity analysis revealed that the lower limit of the number of IFI16 molecules found in immobile clusters is equivalent to eight protomers (Figure 2D and Figure 2—figure supplement 3), which also corroborate the optimal complex (ten protomers) suggested from Figure 1C. Furthermore, individual IFI16 molecules either formed new clusters or joined other clusters in a stochastic manner, and the immobile clusters formed faster with higher IFI16 concentrations (Figure 2E). The rate of addition of IFI16 molecules to clusters is independent on the size of the existing cluster, confirming the absence of strong cooperativity in assembly (Figure 2C; bottom panel). (A) Illustration of the TIRF setup. λdsDNA is anchored to the pegylated coverslip surface by either one or two biotinylated oligonucleotide linkers. Single-biotinylated λdsDNA is constantly stretched by flow during measurements and used for the clustering and nucleosome experiments, whereas double-biotinylated λdsDNA is stably attached whilst being stretched and used without flow for single-molecule diffusion coefficient analysis. (B) Double-biotinylated λdsDNA is anchored to the surface and Cy5-labeled IFI16 molecules (800 pM) are visualized in near TIRF while bound to DNA. Top: Mean-square displacement (msd) trajectories are fitted within their linear regime to calculate the 1D-diffusion coefficient. Bottom: A sample kymograph of a single molecule stably bound for tens of second to DNA and exerting Brownian motion. (C) Elevated IFI16 concentrations result in clustering along λdsDNA. Top: A sample kymograph of multiple IFI16 molecules (3 nM) diffusing along λdsDNA. IFI16 molecules display a net motion along the flow direction. Bottom: Time-resolved clustering is accompanied by a decrease in diffusion coefficients and increase in the number of molecules per cluster. (D) The diffusion coefficient inversely correlates with the number of IFI16 per cluster, resulting in immobile, stable oligomers. (E) Cluster formation is IFI16-concentration dependent. Cy5-labeled IFI16 molecules (3 nM) moving and clustering on single-biotinylated dsλ-DNA at 160 mM KCl at constant flow from left to right. This video is related to Figure 2. The 1D diffusion of IFI16 on dsDNA explains why the assembly rates increase with the DNA length in the bulk experiments (Figure 1C). With the longer dsDNA acting as an antenna, it allows binding of more IFI16 while 1D diffusion facilitates dynamic association (Figure 1D). The saturation of the assembly rate (Figure 1C) can be explained by the square dependence of the diffusional search time on length: at a sufficiently long dsDNA length, the dissociation rate of an individual IFI16 will be faster than the time needed to scan along the entire length of the DNA. In addition, longer DNA substrates work no longer as antennae, but as traps, since individual IFI16 molecules are farther apart and thus less likely to encounter one another (Hu et al., 2006; Turkin et al., 2015; 2016). Overall, the results of our bulk and single-molecule experiments are consistent with the dsDNA-size dependent binding in vitro(Morrone et al., 2014), which also correlates with the IFI16-induced inflammatory responses in vivo(Unterholzner et al., 2010). Thus, we propose that the 1D-diffusion mediated assembly plays a key role in regulating the overall IFI16-mediated immune responses. It has long been speculated that chromatinization acts as the key feature that allows IFI16 to distinguish host from foreign DNA in the nucleus (Kerur et al., 2011; Unterholzner and Bowie, 2011; Li et al., 2012; Orzalli et al., 2012; 2013; Johnson et at., 2014); IFI16 oligomerizes on exposed invading foreign-dsDNA before it becomes hetero-chromatinized. Previous in vivo work demonstrated that transfected chromatinized SV40 DNA is able to evade IFI16 oligomerization and downstream responses (Orzalli et al., 2013). Nevertheless, the molecular mechanism by which IFI16 could use chromatinization to distinguish self from nonself has yet to be identified. To directly address this issue, we first used a competition-binding assay to investigate how IFI16 interacts with dsDNA fragments containing two nucleosomes with varying spacer sizes (6, 30, 50, and 70 bps; Figure 3A and Figure 3—figure supplement 1). Here, di-nucleosomes with 6-, 30-, and 50-bp spacer failed to compete against IFI16-bound FAM-labeled 70-bp dsDNA, (Figure 3B). On the other hand, the di-nucleosome with 70-bp spacer competed similarly as 70-bp naked dsDNA, but significantly more weakly than naked 300-bp dsDNA (Figure 3B). In FRET assembly assays, di-nucleosomes with spacers shorter than 70-bp failed to support assembly (Figure 3C), consistent with our FRET kinetics assays using naked dsDNA (Figure 1B). The 70-bp spacer di-nucleosome supported oligomerization of IFI16; however, the assembly kinetics was again similar to that of naked 70-bp dsDNA, but not that of naked 300-bp dsDNA (Figure 3C). Taken together, these results show that efficient IFI16 cluster formation requires a minimal length of 50-70 base pairs of exposed dsDNA. Considering that the size of dsDNA linker between two nucleosomes is about 20 to 30 bps in mammals (McGhee et al., 1983), these results directly support the hypothesis that chromatinization is a key deterrent for preventing the assembly of IFI16 signaling platforms on self-dsDNA. (A) A cartoon of di-nucleosome constructs with varying dsDNA-spacers. (B) Competition binding assays using IFI16 bound FAM-labeled 70-bp dsDNA against various di-nucleosomes and naked dsDNA. The lines are fits to: 1/(1+([DNAcompetitor]/IC50)^Hill constant), where IC50 indicates the concentration of competitor at 50% efficiency. The mass-concentration of each competitor was calculated using dsDNA, but not histones. (C) The time-dependent changes in the emission ratio between the FRET donor and acceptor labeled IFI16 (50 nM) were monitored at 33 µg/ml of each nucleosome or naked dsDNA. The lines are fits to a first-order exponential equation. To test whether the inhibitory effect of chromatin directly arises by interfering with the 1D diffusion of IFI16, we visualized the movement of individual IFI16 molecules on DNA with nucleosomes. We introduced randomly localized nucleosomes in λdsDNA using recombinant human histone octamers and tagged nucleosome positions with fluorescent antibodies against the N-terminal tail of histone H4 (Figure 4—figure supplement 1). The application of hydrodynamic flow resulted in the single IFI16 molecules being pushed to one direction and clustering at nucleosomal sites on λdsDNA, unable to overcome the octamers by diffusion (Figure 4A, Figure 4—figure supplement 2, and Video 3). Without the antibody, the motion of IFI16 was still confined, whereas for bare λdsDNA, IFI16 moved with a high processivity along the entire strand (Figures 4B,C, and Figure 4—figure supplement 3). These observations are consistent with the bulk experiments (Figure 3), and confirm that nucleosomes directly restrict the 1D diffusion of IFI16 and consequently limit the assembly of IFI16 signaling platforms on dsDNA. (A) Kymographs of Cy5-labeled IFI16 (magenta) binding to λdsDNA with varying numbers of nucleosomes tagged with anti-H4-Atto488 (blue). The number of nucleosomes per λdsDNA were estimated by quantifying IFI16 clustering sites for the lowest nucleosome/λdsDNA ratio (Figure 4—figure supplement 3C), yielding ~2 nucleosomes/ λdsDNA. At low nucleosome concentrations (~2 to 6 nucleosomes/DNA), IFI16 binds to λdsDNA and diffuses with the flow direction, until encountering a nucleosome. At higher concentrations (~20 nucleosomes per λdsDNA), individual IFI16 show only very short diffusive movements upon binding. (B) On naked λdsDNA, IFI16 travels with the flow to the free tip (top), whereas it oligomerizes along the path on nucleosome-loaded λdsDNA (bottom). (C) The overall travel distance of single IFI16 on nucleosome-loaded λdsDNA is reduced compared to bare λdsDNA (nucleosomal λdsDNA: N = 167, bare λdsDNA: N = 141). 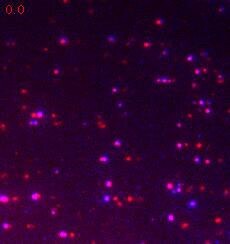 Cy5-labeled IFI16 molecules (1 nM, red) moving on λ-DNA, with on average two nucleosomes per DNA, at constant flow from left to right. Nucleosomes are tagged with fluorescent anti-H4 (Atto488, blue). Most nucleosomes co-localize with IFI16, indicating that they are efficiently blocking 1D-diffusion by IFI16. This video is related to Figure 4. The molecular mechanism by which innate immune sensors distinguish self from foreign dsDNA in the host nucleus has been a major unresolved question in innate immunology (Kerur et al., 2011; Unterholzner and Bowie, 2011; Li et al., 2012; 2013; Orzalli et al., 2012; 2013; Johnson et al., 2014). The oligomerization of IFI16 on under-chromatinized foreign DNA plays a key role not only in initiating inflammatory and antiviral responses, (Monroe et al., 2014; Orzalli et al., 2012; Kerur et al., 2011), but also in regulating the hetero-chromatinization and silencing of viral dsDNA (Johnson et al., 2014; Orzalli et al., 2013). By using time-resolved bulk and single-molecule fluorescence assays, we demonstrate here that IFI16 ID scans along exposed dsDNA to assemble into distinct clusters and that chromatinization is sufficient to inhibit IFI16 from targeting host dsDNA for assembly. In vivo, this 1D scanning mechanism allows a limited number of IFI16 molecules to allocate each other on large genomes of invading pathogens. In combination with 3D sampling of binding sites on a collapsed DNA molecule, this process optimizes the oligomerization and downstream signaling time. While the clustering on dsDNA presents a tempting explanation for the role of IFI16 in viral gene silencing, future in vivo experiments await to test this. IFI16 belongs to the family of AIM2-like receptors, which include other nuclear and cytosolic foreign dsDNA-sensors. It will be interesting to determine whether and how these other related sensors use exposed dsDNA as a 1D 'digital ruler' to regulate their signaling platform assembly. This family of sensors is implicated in a number of autoimmune disorders (Mondini et al., 2007; 2010; Choubey et al., 2010; Gugliesi et al., 2013; Smith and Jefferies, 2014); how regulation of assembly is disrupted may provide insights into these afflictions. Human full-length IFI16 and IFI16HinAB were cloned and expressed using E. coli T7 express cells (NEB) as a C-terminally His6-tagged protein as described in Morrone et al. (Morrone et al., 2014). dsDNA shorter than 90-bp were obtained from Integrated DNA Technologies (IDT) as described in Morrone et al. (Morrone et al., 2014). The complementary strands were dissolved and mixed in 1:1 molar ratio, melted at 95°C for 10 min, and the temperature was lowered to 25°C at a rate of 1°C/min. Ligands of greater length were obtained by polymerase-chain reaction (PCR) using the Maltose Binding Protein fusion tag cloning sequence as template and primers of appropriate sequence for a final length as indicated in the paper. Plasmids containing the Widom-601/603 sequence with indicated linker lengths were a kind gift of Dr. Gregory Bowman. The nucleosomal DNA was obtained by PCR from these constructs with appropriate primers. All substrates were gel-purified. DyLight-550, DyLight-650, or Cy5 fluorophore was incorporated to IFI16 using maleimide chemistry (purchased from Thermo Scientific and Invitrogen) and was performed as described in Morrone, et al. (Morrone et al., 2014). The label to protein ratio was ~ 1:1. Fluorescein-labeled dsDNA72 was obtained from IDT. Lyophylized Xenopus laevis histones H1A, H2A, H3, and H4 were a kind gift of Dr. Cynthia Wolberger. Octamer refolding and nucleosome reconstitution was performed as described in Luger et al. (Luger et al., 1999), at a 2:1 molar ratio of octamer:DNA. An agarose gel of reconstituted nucleosomes is shown in Figure 3—figure supplement 1. All absorption, fluorescence anisotropy, and fluorescence excitation/emission experiments were performed in a Tecan Infinite M1000. All experiments were performed at least three times and the fits to data were generated by Kaleidagraph software (synergy). All reactions were performed in 40 mM HEPES pH 7.4, 160 mM KCl, 5% glycerol, 1 mM EDTA, 0.1% triton-X-100, 5 mM DTT (Reaction Buffer). Here, 300 nM IFI16 and 4.5nM fluorescein-labeled dsVACV72 were incubated together at room temperature for 20 min. Increasing concentrations of competing DNA were added to the reaction to a final concentration of 100 nM IFI16 and 1.5 nM dsVACV72, and the changes in fluorescence anisotropy were recorded as indicated in Morrone et al. (Morrone et al., 2014). All reactions were performed in reaction buffer. 66 µg/ml of each dsDNA or di-nucleosomes was placed in the plate wells, and the reaction was initiated by adding an equivalent volume of IFI16-550 and IFI16-650 (1:1 molar ratio) to the indicated final concentration. The dead time between addition of IFI16 and the first measurement was 15-20 s. The final dsDNA molar-concentrations are at least sixfold higher than their determined binding constants by fluorescence anisotropy assays described in Morrone, et al. (Morrone et al., 2014), and the FRET ratio for each time point was calculated by dividing the acceptor emission (678 nm) by the donor emission (574 nm) (Morrone et al., 2014). Microscope coverslips (Corning) were plasma-cleaned and activated with 100 mM KOH, silanized with 3-Aminopropyl-triethoxysilane in acetone and functionalized with PEG-NHS and biotin-PEG-NHS (Laysan-Bio) in sodium bicarbonate with a 1:3 mass ratio (Tanner and van Oijen, 2010). Streptavidin (Sigma Aldrich) was used for anchoring the biotinylated DNA substrates to the coverslip surface. Flow channels were constructed with custom-made PDMS chips to obtain dimensions of 10 mm length, 100 µm height, and 1 mm width, and connected to a syringe pump to allow constant flow during the measurements. Single-molecule assays were performed in 40 mM HEPES (pH 7.4), 160 mM KCl, 1 mM EDTA, 2 mM DTT, 10% glycerol, 0.1% Triton-X100, 250 µg/ml BSA, 1 mM Trolox, 40 mM glucose, 250 nM glucose oxidase, 60 nM catalase, unless otherwise stated. All assays were performed at room temperature. We applied 100 nM YoPro-1 iodide (Life Technologies) at the end of the measurements to visualize the DNA substrates. Reactions were illuminated with a 488-nm and 641-nm laser (Coherent), and images were acquired with an EMCCD camera (Hamamatsu). We used MetaVue imaging software (Molecular Devices) for data acquisition and ImageJ and R for analysis. Lambda-DNA (New England Biolabs) was biotinylated at one or both ends by ligation of the respective complementary biotinylated oligos according to Tanner et al. (Tanner and van Oijen, 2010) (oligo sequences are given in Supplementary file 1B; purchased from IDT). Single-biotinylated DNA templates were stretched by constant flow (20 µl/min) throughout the experiments (IFI16 clustering and nucleosome assays). Double-biotinylated DNA templates were applied to the flow cell at high flow velocity (100 µl/min). This allowed binding of the DNA to two biotin moieties, while the DNA was stretched. Free DNA was washed out, IFI16 applied to the flow cell, and flow was then stopped for acquisition of the single molecule diffusion traces. To reconstitute nucleosomes, recombinant histone H2A/H2B dimers and H3/H4 tetramers (New England Biolabs) were assembled on biotin-λ-DNA and biotin-601 sequence (Epicypher) by salt-gradient dialysis (2 M to 0.3 mM NaCl in 5 steps, each step with an incubation time of at least 2 hr) in 10 mM Tris/HCl, pH 7.4, 0.1 mM EDTA, 0.5 mM DTT. We tested nucleosome reconstitution by an EMSA assay on digested λ-DNA (Figure 4—figure supplement 1). For this, we generated DNA fragments by digestion with EcoRI (NEB), purified them (Qiagen DNA spin columns) and reconstituted nucleosomes in the concentration ratios that we also used for full-length λ-DNA. Antibodies against human histone H4 and H2B were chosen to target the N- terminal histone tails (Santa Cruz, sc-8657 and sc-8650), and labeled with Atto488-NHS (Life technologies) in PBS at pH 7.0. Labeled antibodies were negatively tested against bare DNA and Ifi16 clusters in the microscopy assay, and showed high specificity for nucleosomal DNA preparations only. λ-DNA templates, loaded with nucleosomes and tagged with anti-H4, were constantly stretched in the flow channel. Ifi16 co-localized strongly with the nucleosome signal (Video 3, Figure 3—figure supplement 1). In contrast, biotinylated 601-sequence prepared with nucleosomes and tagged with anti-H4-Atto488, hardly showed co-localization with Ifi16, indicating, that there is not sufficient exposed dsDNA available for binding (Figure 4—figure supplement 2). with viscosity η, radius r and distance y.
with v=∑jall traj.xj,final-xj, initial∑jall traj.tj,final-xj, initial≈0.127 μm/s. In order to evaluate the effect of flow on the clustering mechanism, we implemented a 1D-random walk Monte-Carlo simulation (Figure 2—figure supplement 4). Here, we calculated the expected search time for two IFI16 molecules (with D=0.026 µm2/s) to allocate each other on a λ-DNA molecule congested with a varying amount of other diffusing IFI16 molecules (10, 50, 100 molecules). As all particles are equal, we segmented the DNA according to the total number of molecules bound and calculated the effective distance between two particles by using the absolute distance modulo the segment length in order to take the periodic boundaries into account. We allowed a maximum distance of 10 nm to consider two particles having met and dimerized. To simulate flow similar to our experimental conditions, to each random step the term vdt was added (The Python code is found in Source code 1). Proceedings of the National Academy of Sciences of the United States of America 103:5752–5757. Journal of Interferon & Cytokine Research 30:371–380. Cell Host & Microbe 9:363–375. Proceedings of the National Academy of Sciences of the United States of America 109:16552–16557. Cell Host & Microbe 14:591–599. Proceedings of the National Academy of Sciences of the United States of America 109:10558–10563. Annals of the New York Academy of Sciences 1110:47–56. Proceedings of the National Academy of Sciences of the United States of America 111:E62. Proceedings of the National Academy of Sciences of the United States of America 110:E4492. Proceedings of the National Academy of Sciences of the United States of America 109:E3008. Annual Review of Microbiology 68:477–492. Cytokine & Growth Factor Reviews 25:745–757. Proceedings of the National Academy of Sciences of the United States of America 108:563–568. Physical Review E, 92, 10.1103/PhysRevE.92.052703. Cell Host & Microbe 9:351–353. Thank you for submitting your work entitled "The innate immune sensor IFI16 recognizes foreign DNA in the nucleus by scanning along the duplex" for consideration by eLife. Your article has been evaluated by John Kuriyan (Senior editor) and three reviewers, one of whom is a member of our Board of Reviewing Editors. The manuscript reports on single molecule tracking studies of the IFI16 DNA sensor on DNA molecules without or without loaded nucleosomes. The work shows that IFI16 can diffuse along the naked DNA and form oligomers. Movement along the DNA is impeded by nucleosomes if spaced closely enough and oligomer formation is reduced. The authors conclude that IFI16 scanning is required for oligomer formation. This is a very timely and potentially important piece of work. 1) The connection of scanning to IFI16 function is probably beyond the scope this manuscript, but the text needs to more clearly state that IFI16 scanning on DNA could contribute to both innate signaling and epigenetic silencing initiated by IFI16 binding to DNA. 2) The reviewers all felt that the conclusion that scanning was required for oligomer formation needed further documentation or was too strong. One reviewer felt that additional biophysical studies were needed to relate scanning to oligomer formation, while the other two had questions about the specific interpretation of the results. For example, the question of how the binding stoichiometry of IFI16 relates to the two HIN DNA-binding domains was considered and what is the role of each of the HIN domains? How were the data interpreted to allow the conclusion that scanning is required for oligomer formation as opposed to a parallel process to cooperative binding? How was the lower limit of the number of IFI16 molecules per immobile cluster determined? Much of this involves revising the manuscript for a more general audience but may require some additional experiments. 3) There are some minor issues on referencing as addressed below that should be addressed. There are a number of details that are embedded in the individual reviews so we are including those so the authors can understand the issues more fully. The areas that need to be addressed are summarized above. Reviewer #1: This manuscript reports on single molecule tracking studies of the IFI16 protein on dsDNA. Consistent with previous studies from the Sohn lab, IFI16 binding to DNA requires large DNA fragments involving oligomers of IFI16. To examine the mechanism of assembly of the oligomers, they tracked single molecules of IFI16 on stretched DNA. They observed that IFI16 tracks along stretches of DNA and they interpret this as required for assembly of the oligomers. Addition of nucleosomes to the DNA at sufficiently high density prevented IFI16 from moving and oligomerizing. The scanning of IFI16 along DNA to assemble oligomers to initiate signaling for either innate responses or epigenetic silencing is an important observation. The definition of a mechanism by which IFI16 distinguishes between foreign and self DNA is an important result as well, so this is potentially an important piece of work for the field. I have one reservation. It is not clear from the presentation how the results demonstrate that scanning is required for the assembly of the oligomers versus just happening in parallel to cooperative binding. The text needs to better define the reasoning and interpretation of the results to allow this conclusion. This may be in part due to a lack of background of this reviewer, but manuscripts for eLife should be written for the general reader. For example, in the fourth paragraph of the main text it is not clear how the lower limit of the number of IFI16 found in immobile clusters was determined to be 8. 1) Main text, second paragraph. Johnson et al., 2013 is really derivative of the other earlier references, which should include Orzalli et al., 2012. 2) Main text, second paragraph. IFI16 is associated with autoimmunity, but it not known how it "promotes" it. 3) Main text, sixth paragraph. This states that the chromatin inhibition hypothesis has not been tested directly. Orzalli et al., 2013 did compare gene expression of SV40 DNA in chromatin versus free DNA. Reviewer #2: In this manuscript, Stratmann et al. used a combination of bulk biochemistry and single molecule analysis to investigate the filament assembly process of IFI16 on dsDNA, and the mechanism by which IFI16 measures the dsDNA length as a basis for self vs. non-self-discrimination. Through FRET kinetics analysis, the authors showed that IFI16 binds to dsDNA in a length dependent manner (which was also reported in their earlier paper, Morrone et al., PNAS 2014), and drew the conclusion that 10 protomers are necessary to form the stable filament nucleus. They then used TIRF microscopy to show that IFI16 can diffuse on DNA under flow and proposed that this facilitates filament assembly and DNA length measurement. The authors also used the nucleosome coated DNA to show that IFI16 can only diffuse within the nucleosome-free region of DNA, and proposed that the nucleosome structure limits its filament assembly on self DNA. The proposed model of DNA sensing by 1D diffusion is interesting and novel. However, I have a number of concerns. In particular, the authors failed to show the importance of diffusion in filament assembly, which is the main conclusion of this manuscript. The length sensitivity observed between ~50 bp-200 bp in Figure 1B,C does not necessarily need to involve 1D diffusion. This is particularly true since the kinetic data in Figure 1B can be reasonably fit without invoking diffusion (and just by using first-order exponential equation). In order to show the importance of diffusion, the authors should show that 3D diffusion alone cannot explain the observed assembly rate, and there should be at least two parameters (1D diffusion and 3D diffusion rates) affecting the assembly rate. Another reason that makes me doubt about the importance of diffusion is the range of DNA length that IFI16 appears to sense. The authors observed the assembly rate increases with the DNA length but plateaus around ~200 bp. Since the authors clearly showed that IFI16 can diffuse far beyond 200 bp (>2-3 kb), this observation cannot explain the observed saturation at ~200 bp. On the other hand, this can be simply explained by the requirement of ~10 protomers to form a stable filament, as suggested by the authors. Note that there are proteins that form filaments in a nucleic acid length-dependent manner but without 1D diffusion. If diffusion is important for filament assembly, there should be a length dependence beyond 200 bp, especially at low protein concentration where the 3D diffusion-mediated filament assembly is significantly compromised. Again, without kinetic modeling that clearly shows the inconsistency with 3D diffusion and requirement for 1D diffusion, it is hard to arrive at the same conclusion as the authors. Another concern is that the 1D diffusion was shown only under flow. I understand that this is required to visualize diffusion (as you need to stretch the DNA), but this makes diffusion mostly uni-directional, and could likely affect the scanning processivity and the contribution of diffusion to filament assembly efficiency. More importantly, long DNA (perhaps those of viral DNA) collapses in the absence of flow, in which case 3D diffusion (or hopping), in comparison to 1D diffusion, could be more important for the filament assembly. In summary, while the authors showed 1D diffusion under flow and length sensitivity in bulk biochemistry, I don't think their data suggest that 1D diffusion is required for the length sensitivity and filament assembly. Reviewer #3: This is a timely and important study that addresses a fundamental question in immune response: How does a nuclear DNA sensor recognize pathogenic dsDNA from host dsDNA within the same subcellular compartment (i.e., nucleus), a recognition critical for the initiation of immune signals? The study focuses on the nuclear DNA sensor IFI16, the interferon inducible protein 16. The authors used fluorescence assays to investigate the binding of IFI16 to foreign dsDNA, first measuring the number of IFI16 molecules necessary for assembly. Using single-molecule fluorescence imaging, the authors go on to monitor the diffusion of IFI16 along lambda-phage dsDNA. Lastly, as chromatinization was previously proposed as a critical contributor to the ability of IFI16 to distinguish between host and foreign dsDNA, the authors perform competition-binding assays and time-resolved fluorescent assays to gain further insight into the impact of chromatinization on pathogenic DNA sensing. Overall, this study elegantly incorporates fluorescence imaging assays to address current questions relevant to the initiation of intrinsic and innate immune responses. This study can have a broad impact on understanding mechanisms of host defense against nuclear-replicating DNA viruses. 1) Based on the FRET results shown in Figure 1, the authors propose that four molecules of IFI16 are required for the initiation of the assembly, while ten molecules are required for oligomerization. This calculation relies on the important previous finding from this lab that the footprint of one IFI16 is ~15 bp (Morrone et al. 2014). The authors should clarify if this requires the binding of both HIN domains and if so, how they ensured in this new experiment that both HIN domains of IFI16 are simultaneously bound to the dsDNA. Can there be a circumstance in which a HIN-A domain of one IFI16 molecule and the HIN-B of another molecule bind to dsDNA? Would this interfere with the calculation of the necessary footprint? 2) The authors propose that IFI16 scans along dsDNA (Figures 1 and 2). However, the mechanism of scanning is still not well defined. IFI16 has two HIN domains that can bind dsDNA with different efficiency. Is the scanning along the DNA substrate accomplished in a similar manner as a two-headed molecular motor? Are both HIN domains required for scanning? Should one of the HIN domains release its binding for the scanning to occur? Some of these questions are difficult to address and may be outside the scope of the current paper. However, one question that could be addressed and that would provide important mechanistic insight is how do the HIN-A and HIN-B domains behave individually? The authors could test this by performing the same studies with individual HIN-A or HIN-B domains. If the diffusion and dissociation behaviors of the individual domains change relative to the HIN-A/HIN-B construct, this may suggest that both domains are required for scanning. 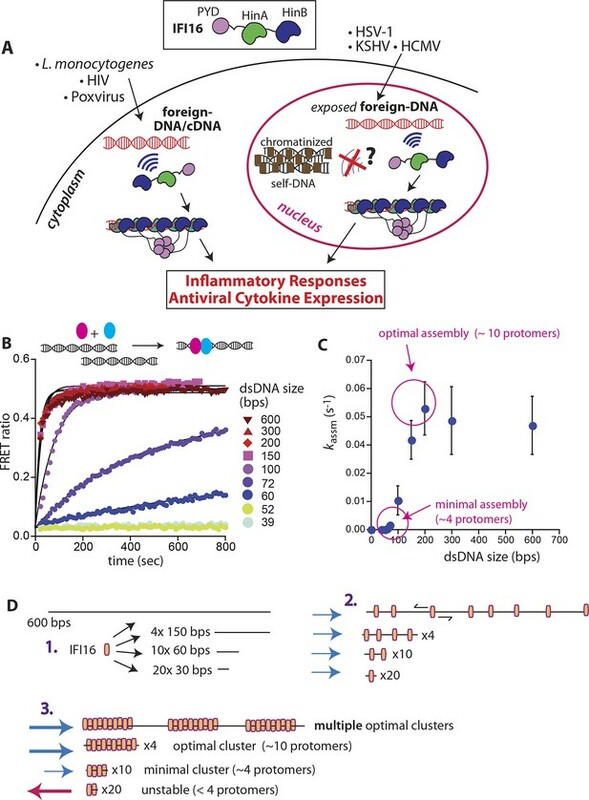 3) The authors show beautifully the movement of IFI16 along the lambda-phage dsDNA and propose that this diffusion is critical for IFI16-mediated immune responses. However, it is not clear if this movement is a property specifically required for triggering immune response rather than a property involved in the transcriptional regulatory functions of IFI16. Are the immobile clusters sufficient for triggering immune response? The authors could add to their Discussion to address these possibilities. Our results indicate that one-dimensional diffusion allows IFI16 to assemble into distinct clusters specifically on naked or underchromatized DNA of several kbp length. These clusters are seen as the active “firing” form, because the oligomerized PYD domains are thought to be the platform for downstream signaling (e.g. [1, 2]). In the revised manuscript, we expanded the Discussion to highlight this aspect. We are aware of the recent literature on epigenetic silencing that might be initiated by IFI16 as well (e.g. ). It is difficult, however, with our in vitroassays to derive a possible epigenetic silencing mechanism mediated by IFI16. However, we revised the discussion in our revised manuscript to raise this possibility. These are all important questions and we are grateful for the reviewers to have raised them. Below, we will discuss these issues one by one. In summary, we obtained assembly rate constants as a function of protein concentration to exclude a major contribution of cooperativity, and introduced new single-molecule analyses to support the same assertion. We calculated the effect of flow on the one-dimensional diffusion of individual IFI16 proteins and show it to be negligible. Finally, we inserted additional information and explanation in our manuscript to better address a number of the issues raised by the reviewers. 3) There are some minor issues on referencing as addressed below that should be addressed. There are a number of details that are embedded in the individual reviews so we are including those so the authors can understand the issues more fully. The areas that need to be addressed are summarized above. 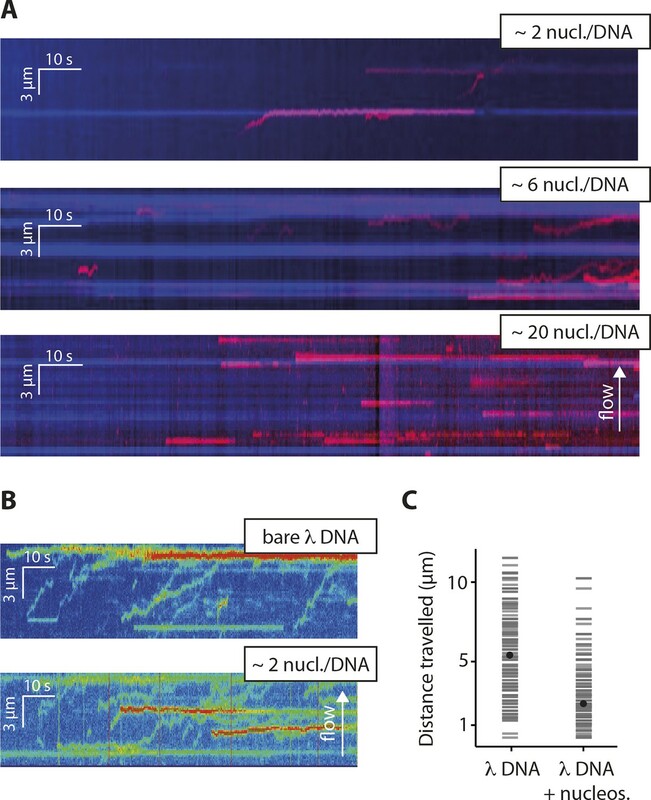 This manuscript reports on single molecule tracking studies of the IFI16 protein on dsDNA. Consistent with previous studies from the Sohn lab, IFI16 binding to DNA requires large DNA fragments involving oligomers of IFI16. To examine the mechanism of assembly of the oligomers, they tracked single molecules of IFI16 on stretched DNA. They observed that IFI16 tracks along stretches of DNA and they interpret this as required for assembly of the oligomers. Addition of nucleosomes to the DNA at sufficiently high density prevented IFI16 from moving and oligomerizing. The scanning of IFI16 along DNA to assemble oligomers to initiate signaling for either innate responses or epigenetic silencing is an important observation. The definition of a mechanism by which IFI16 distinguishes between foreign and self DNA is an important result as well, so this is potentially an important piece of work for the field. I have one reservation. It is not clear from the presentation how the results demonstrate that scanning is required for the assembly of the oligomers versus just happening in parallel to cooperative binding. The text needs to better define the reasoning and interpretation of the results to allow this conclusion. This may be in part due to a lack of background of this reviewer, but manuscripts for eLife should be written for the general reader. The reviewer raises a very important issue, one that was also brought up by reviewer #2. To address this concern, we performed experiments in which we use solution-based FRET to monitor the assembly rate of IFI16 aggregates on DNA for different protein concentrations. As shown in Supplementary file 1, for all DNA lengths, a doubling of the concentration results in a doubling of rates, a result that cannot be reconciled with any major cooperativity in protein concentration. Furthermore, as shown in Author response table 1 below, the calculated Hill constants from our previous FRET assays that monitor the equilibrium assembly of IFI16 oligomers are generally below two for dsDNA sizes ranging from 60 to 2000 bps (Morrone et al., PNAS 2014, Figure 4 and Author response table 1) . These observations consistently disagree with a highly-cooperative assembly model where the expected Hill constants should be near the number of molecules per cluster (~ ten). Overall, we cannot exclude modest amounts of cooperativity (with Hill coefficients near two), but our data cannot be fit using cooperative binding curves with larger Hill coefficients. Further, we analyzed the growth kinetics of individual IFI16 clusters on the DNA. Strong cooperativity in cluster formation would result in a strong deviation from linearity in the number of molecules per cluster over time. After all, cooperativity would allow for faster binding of additional IFI16 once the first ones are bound or, in the extreme case, would support the simultaneous binding of a number of IFI16 molecules. Figure 2 shows clearly that the rate of growth of a cluster is linear with time and independent on the number of IFI16 molecules already present. We modified the Discussion to reflect that modest amount of cooperativity may be present, but that our observations are most consistent with the assembly model where the major mechanism of cluster formation is driven by one-dimensional diffusion. For example, in the fourth paragraph of the main text it is not clear how the lower limit of the number of IFI16 found in immobile clusters was determined to be 8. We included in our manuscript a better description of how we calibrated the number of IFI16 molecules per cluster. Briefly, we divide the fluorescence intensity of a cluster by the mean intensity value of a single IFI16 protein. Since the proteins are labeled with, on average, a single dye and the single dyes give rise to the same fluorescence intensity (provided the excitation conditions are similar), the intensity values of individual proteins form a narrow distribution, whose mean value can be used to ‘count’ the number of proteins in a cluster. We obtained the mean intensity value for single IFI16 molecules by analyzing those that bind transiently to the lambda DNA, and calculated from this mean intensity value (for the same laser power, time acquisition settings, TIRF angle) the molecules in clusters that form at the critical concentration of 3 nM. We added the intensity histogram in Figure 2—figure supplement 2. I have a few minor citation issues as well: 1) Main text, second paragraph. Johnson et al., 2013 is really derivative of the other earlier references, which should include Orzalli et al., 2012. Agreed; we referenced Orzalli et al., 2012, in the revised manuscript. We revised the text to make this section more clear. Thank you; we revised the manuscript to include a brief statement on the in vivowork. […] The proposed model of DNA sensing by 1D diffusion is interesting and novel. However, I have a number of concerns. In particular, the authors failed to show the importance of diffusion in filament assembly, which is the main conclusion of this manuscript. The length sensitivity observed between ~50 bp-200 bp in Figure 1B,C does not necessarily need to involve 1D diffusion. This is particularly true since the kinetic data in Figure 1B can be reasonably fit without invoking diffusion (and just by using first-order exponential equation). In order to show the importance of diffusion, the authors should show that 3D diffusion alone cannot explain the observed assembly rate, and there should be at least two parameters (1D diffusion and 3D diffusion rates) affecting the assembly rate. The reviewer brings up an important point that is partly related to reviewer #1’s concerns about a possible cooperativity mechanism. We can exclude cluster formation taking place via three- dimensional search mechanisms in the absence of cooperativity: With our observation that a minimum number of four IFI16 molecules are needed to form a stable cluster and in the absence of cooperativity, chances that these four molecules will arrive at the same time on the same point of DNA are negligibly small (the probability roughly scales inversely with the number of available binding sites available per protein raised to the power N, with N being the number of proteins that need to arrive simultaneously). An alternative mechanism, however, would be a highly cooperative one (as also suggested by Reviewer #1). This is unlikely for the reasons that we described in our reply to Reviewer #1 (please see the discussion above). The reviewer brings up an important point. While it is true that a minimum of ~200 bp is needed to provide sufficient space to form a stable oligomer, it is not necessarily true that a further increase in length would further speed up the reaction kinetics. After all, lengthening DNA would also increase the average distance between neighboring proteins bound to DNA, and thus slow down their association via 1D diffusion . We would like to point out two papers that we published in the last month addressing this particular issue. One of these papers  studies the association kinetics of two DNA-sliding entities and finds no strong DNA-length dependence. A theoretical paper  describes an analytical model based on a mean-field kinetic description of linear extended sinks (representing DNA) that can trap molecules present in a solution. The model presented there accurately describes the observed independence of reaction rate on DNA length and further demonstrates that the major contribution to association kinetics is one- dimensional sliding. While we agree with the reviewer that the data mentioned above alone cannot positively confirm the importance of a scanning component, it also cannot be used to exclude such a contribution. We acquired the diffusion coefficients for individual IFI16 molecules and the HinAB construct on DNA templates, which were tethered at both ends to the surface and did not require a constant flow. Therefore, the robust 1D diffusion seen in Figure 2B and Figure 2—figure supplement 1 is an intrinsic feature of IFI16/HinAB. Indeed, applying flow during the clustering experiments changes the diffusion behavior in terms of directionality and slightly in the value of the diffusion coefficient. We added a correction term for calculating the diffusion coefficient under flow (also described in ), and also added a Monte-Carlo model, in which we simulated the clustering behavior with and without flow bias (Figure 2—figure supplement 4, and Supplementary Information). Here we did not observe a strong effect induced by flow. The direction bias might change the absolute timing of clustering in our experiments. However, we want to stress with Figure 2C-E that the property of diffusion/scanning correlates with the number of molecules within an aggregate. Large clusters are immobile elements on the DNA with a high stability that we propose would correspond with the initial platforms for downstream signaling. As the reviewer points out, in the cell IFI16 clusters on collapsed DNA. This indeed might change clustering, as now a combination of 1D scanning and 3D hops to nearby DNA segments is favorable to find other proteins bound to DNA (also described in ). Having now gained knowledge about the mechanism of IFI16 binding to DNA, i.e. its ability of 1D scanning over kbp lengths, we included this aspect better in our Discussion. The footprint of IFI16 was determined using multiple dsDNA sizes and full-length protein . Also as shown in the previous study by Morrone et al. , mutants with either the HinA or the HinB domain show a similar binding behavior on short DNA substrates (72 bp) as the full-length protein, albeit with a small reduction in DNA affinity in the absence of either domain. Due to the geometry of the Hin domains and the footprint of one Hin domain being ~ 7 bp , we do not expect a significant change in the footprint length. We agree that this aspect of Hin domain contribution to the binding is very interesting, especially in the context of a comparison with the DNA binding domain of Aim2 and its potential diffusion behavior. However, we feel that those experiments would be beyond the scope of this manuscript, which is focused on the distinction of self and foreign DNA. We added this aspect to our conclusion and referenced the appropriate work suggesting PYD- domain dependent signaling. 1) Lu, A. et al. Unified polymerization mechanism for the assembly of ASC-dependent inflammasomes. Cell 156, 1193-206 (2014). 2) Vajjhala, P.R., Mirams, R.E. & Hill, J.M. Multiple binding sites on the pyrin domain of ASC protein allow self-association and interaction with NLRP3 protein. J Biol Chem 287, 41732-43 (2012). 3) Orzalli, M.H., Conwell, S.E., Berrios, C., DeCaprio, J.A. & Knipe, D.M. Nuclear interferon-inducible protein 16 promotes silencing of herpesviral and transfected DNA. Proc Natl Acad Sci U S A 110, E4492-501 (2013). 4) Morrone, S.R. et al. Cooperative assembly of IFI16 filaments on dsDNA provides insights into host defense strategy. Proc Natl Acad Sci USA 111, E62-71 (2014). 5) Hu, T., Grosberg, A.Y. & Shklovskii, B.I. How proteins search for their specific sites on DNA: the role of DNA conformation. Biophys J 90, 2731-44 (2006). 6) Turkin, A. et al. Speeding up biomolecular interactions by molecular sledding. Chemical Science (2016). 7) Turkin, A., van Oijen, A.M. & Turkin, A.A. Theory of bimolecular reactions in a solution with linear traps: Application to the problem of target search on DNA. Physical Review E 92, 052703 (2015). 8) Leith, J.S. et al. Sequence-dependent sliding kinetics of p53. Proc Natl Acad Sci U S A 109, 16552-7 (2012). 9) Halford, S.E. & Marko, J.F. How do site-specific DNA-binding proteins find their targets? Nucleic Acids Res 32, 3040-52 (2004). We thank Drs. Cynthia Wolberger and Gregory Bowman for their assistance in generating di-nucleosomes, Michiel Punter and Dr. Victor Krasnikov for advice with data analysis and microscopy, and Dr. Karl Duderstadt and Dr. Bastian Niebel for a critical reading of the manuscript. JS acknowledges support from the Jerome L. Greene Foundation and AvO from the European Research Council (ERC Starting 281098) and the Australian Research Council (FL140100027). © 2015, Stratmann et al.